This private tour will take you on a jungle adventure at Punta Laguna Nature Reserve. You will kayak on a lagoon, zipline and soar through the jungle and hike in search of one of the mysterious species of Yucatan, the spider monkey. You will learn all about the spider monkey and observe other beautiful species in the area including birds, little reptiles and much more. The tour includes a professional guide, light lunch and hotel pickup and drop-off. Experience the old and the new of Maya culture, with a dash of adventure, on this full-day tour from Cancun. Wander the ruins of Coba, an ancient Maya city, and huff your way to the top of Nohoch Mul, the second-tallest pyramid on the Yucat'n Peninsula. Visit a small Maya village, where you'll feast on classic fare and receive a blessing from the local holy man. Zoom through the rain forest along ziplines, rappel down into a cenote and paddle a canoe on a lagoon. Hotel transport is included. Coming to the Caribbean and not doing a'zip lining tour is missing out half of the fun of the trip! Come to the'fantastic 10 towers and 6 lines'Eco Park'and try one of the most popular 'tours'of all times. Experience a great'ziplining tour in the area! 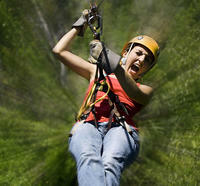 In our'Eco-Park you will find six different zip-lines, four in the jungle and two in the cenote. And you will also ride an ATV across the jungle! This is a two tours'adventure in one.